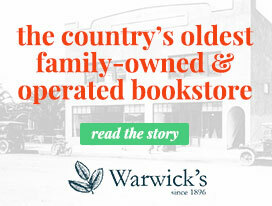 Margie, one of our longest tenured staff members, spends her days in the Office Supplies department at Warwick's, but she spends her nights curled up with a good book. Here are a few of her latest reads. In this biography of a marriage, Dyan Cannon shares her tempestuous life with Hollywood legend Cary Grant. 33 years her senior, Cary Grant pursued 22-year-old Cannon, resulting in a loving, yet often tortuous marriage and a beautiful daughter. Yet Cannon’s eventual realization that Cary’s love of control and a series of darker secrets led to the destruction of their relationship. Dear Cary is an insightful look at one of Hollywood’s greatest stars, and a poignant memoir of love and loss. Victoria Jones has always felt detached from the world, unloved, and alone. Bouncing around in the foster care system for the majority of her life, she is thrust out on her own at 18 with no one and nothing to help her, until the day her love of flowers and the language of flowers presents her with an opportunity to blossom in unforeseen and life changing ways. Moving and heartfelt, I can’t recommend this novel enough. Jane was raised in a large Catholic family, with parents who shared a rich Irish sense of humor with their five children. A born entertainer, Lynch went through a series of pitfalls (alcohol addiction, struggles with her own sexuality) and triumphs (Two and a Half Men, Glee), and her remarkable talent and pure love of her job have led her to become a well-recognized and highly respected member of the Hollywood community. This bio is both heart-felt and uproarious, put together in a way only our favorite “Sue Sylvester” could. Enjoy! Jacqueline Kennedy’s interview with Arthur M. Schlesinger Jr., just 4 months after President Kennedy’s assassination is astonishing. In her own words you will feel how proud she was of her husband and the importance of her love for her family that she expresses throughout the interviews. This was an amazing and important period of history that can never be forgotten, brought to life within these intimate interviews. The day President Kennedy was assassinated by Lee Harvey Oswald was devastating. But what if history could be changed? When history teacher Jake Epping finds a way to go back in time that is exactly what he plans on doing, but Jake learns quickly that time doesn’t like to be messed with. King clearly loves this era and skillfully transports readers with his eye for detail. If you haven’t read King in awhile, his masterful skill of writing will blow you away.